The Brigg Line Group has been set up to promote services on the Sheffield Midland - Worksop - Retford - Gainsborough - Lincoln line and the branch line from Gainsborough via Brigg and Grimsby to Cleethorpes. Northern Rail operates trains on the Sheffield Midland - Lincoln route, and from Sheffield Midland to Cleethorpes on Saturdays only. The Brigg Line Group argues that the Lincoln service needs to be improved and the Cleethorpes service should operate six days a week. They also want to see an end to the practice whereby Network Rail doesn't allow trains on the Sheffield - Lincoln route until 13:30 on Sundays. In the meantime, the group sees its role as encouraging more people to use existing services so that they can build the case for improvements in the run-up to renewal of the Northern franchise. An infrequent East Midlands Trains service between Doncaster and Peterborough also runs over the Gainsborough - Lincoln section, and again The Brigg Line Group wants to see additional trains on this service. Station facilities across the region need updating, and some stations (most notably Brigg and Gainsborough Central) need complete refurbishment to bring them into the 21st century. The Brigg Line Group was formerly known as Friends Of The Brigg & Lincoln Lines, hence references to FoBLL in the older news items below. November 2017: The Brigg Line has been featured in the Independent newspaper. 3 April 2017: Here is the latest from the Brigg Line Blog, including news of a welcome new ticket. The new Kirton In Lindsey or Brigg to Market Rasen or Lincoln Central ticket means that with a change at Barnetby customers with a North Lincolnshire senior citizen can have a return trip to Lincoln Central for just £5. 18 March 2017: Sadly there has been more vandalism and flytipping at Brigg, as the latest blog explains. 11 March 2017: On 10 March Ian Prosser, the Chief Inspector of Railways, came to visit Gainsborough. Find out what he had to say in the latest blog. March 2017: There have been several updates to the Brigg Line Blog recently. The most recent entry celebrates the increasing number of passengers travelling on the Saturday-only service. December 2016: The Brigg Line Group has a new blog where you can find all the latest news and photos! April 2016: Paul from FoBLL gave a presentation to Brigg Town Council about the ongoing situation in the station area with flytipping, arson, dumped rubbish and criminal damage. Most attendees were supportive, though a small number of councillors showed how out-of-touch they were. A full public consultation will take place in the next few months about the Brigg station area. April 2016: Network Rail recently built a new, £400,000 footbridge at Brigg with no ramps. This is a problem for many people, including a wheelchair-user whom we met recently. He was helped off the Sheffield to Cleethorpes train at Brigg at 13:24 as he was visiting the town for the farmers market. Because he couldn't cross the line at Brigg, after the market he had to travel on the 17:27 service from Brigg to Barnetby, arriving at 17:37, then use the disabled access footbridge at that station to travel over to Platform Three. He then waited until 19:02 to catch the train service back to Worksop via Brigg, ironically the same train he had alighted from at 17:37. April 2016: Friends Of The Brigg & Lincoln Lines - along with partners Gainsborough and District Rail and Bus Users Group - are looking into the possibility of forming a Community Rail Partnership. The proposal is for a 'North Notts and Lincs CRP' (see map, right). Community rail partnerships (CRPs) bring local communities and train operators together to improve the rail environment through community awareness and involvement. CRPs have been instrumental in achieving spectacular increases in use of rail through innovative marketing, improved services and better station facilities. We are working with Arriva Rail North to establish how a partnership can be formed. Indication of support for a North Notts and Lincs CRP from organisations and members of the public is an essential prerequisite. April 2016: On Friday 1 April Arriva took over the Northern Rail franchise on a nine-year contact. We have worked well with Northern Rail and we're sure this will continue with Arriva. After five years of passenger growth on the Saturday-only service it's now time to get down to business and provide the people we represent with a more frequent service and a better pricing structure as the present one is stopping new customers from travelling. FOBLL has been praised by Town Mayor James Truepenny. Stressing how the town enjoys fantastic support from The Friends, he said: "This is one of the most enthusiastic and well prepared groups, who work hard to keep all levels of government informed on how the line is genuinely affecting customers. They provide agencies with invaluable evidence and information." March 2016: Passenger numbers on the line are picking up nicely: on 19 March the 0803 Sheffield to Cleethorpes train was around 70% full leaving Worksop. With this in mind, ticketing on the line must be improved as a matter of priority. At the moment there are some illogical price discrepancies which put people off using the service. The idea of a Brigg Line Rover ticket seems popular and we think would boost numbers. Such a ticket could be valid between Gainsborough Central - Kirton In Lindsey and Brigg, to use on all six trains at a cost of £5 for Adults and £2.50 for children. This would rise in price with an improved Saturday service. March 2016: Following a three-year battle with North Lincolnshire Council's Highways Department, new signage has gone up on two highway signs at either end of Brigg, telling people how to get to the station. We are also delighted to see a Tourist Information Box put up at the end of Station Road by the Brigg Town Partnership; customers getting off the train can now pick up a free map. We can confirm that the three local Brigg councillors are looking at putting pedestrian signage up in the town for the railway station; FoBLL are finding pricing options for them as we speak. 29 February 2016: It was pleasing to see a number of new faces at Gainsborough Central boarding the 1220 service to Sheffield Midland on Saturday - marvellous what a few new signs in a town can do. It has been noted that customers leaving the train at Gainsborough Central from the Cleethorpes direction all make their way over the footcrossing and not the new, ill-advised footbridge built with no ramps at a cost of £400,000. 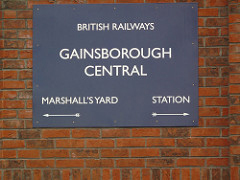 February 2016: A new 1950s-style sign for Gainsborough Central Station has now been put up [pictured right]. FoBLL is pleased that something has been bought that represents long-term value for money and will benefit future customers using Gainsborough Central. January 2016: You are cordially invited to the next meeting of the Brigg Line Action Plan, to be held at Trinity Arts, Trinity Street, Gainsborough, DN21 2AL, commencing at 14:00 on Wednesday 27 January. What does £400,000 get you these days? Well if you're Network Rail it gets you an over-budget footbridge that has no ramps and - at one month old - is already beginning to rust! The level crossing at Brigg has been broken for weeks now and staff have to come out and open/close the gates manually; this has caused some delays on the line. January 2016: After being closed for a number of weeks due to the Northern Lincolnshire resignalling scheme, the Brigg Line is fully reopen again. The Gainsborough Rail and Bus Group have designed a timetable that will be going on all of the posterboards. A4 timetables have also been printed and will be distributed shortly. At Brigg, a meeting is planned with councillors to forward plans for a footpath from the end of Station Road to the Station front. Sadly North Lincolnshire Council's highways department refused again to grit Station Road and up to the station, resulting in a lot of ice. At Kirton In Lindsey, FoBLL have been clearing a section of trees behind the waiting shelter; this has opened up the area and hopefully will stop the drainage becoming blocked. At Gainsborough Central (officially the UK's worst railway station) the waiting shelter that was tossed in the undergrowth has now been tarmaced back into place minus a roof or seats. The idea was to replace it with something new, but this has been cancelled since the cost of the two new 'non ramp' footbridges at Gainsborough Central and Brigg has risen from £200,000 to £400,000. January 2016: The Friends Of The Brigg & Lincoln Lines and our partners The Gainsborough Rail and Bus Group are pleased to announce brand new pedestrian signage to direct visitors to both Gainsborough Central and Gainsborough Lea Road stations (see pic, right). The last signage for Gainsborough Central was removed in 1983 and never replaced! December 2015: Because of the major delays that the Brigg Line trains have had over the last 4-5 weeks many travellers are now staying at home as they are now unsure whether their train is going to turn up. This of course highlights the fact that the 'Saturday Only' stations of Gainsborough Central, Kirton In Lindsey and Brigg need some form of customer help point or display for the future. FoBLL and GRaB (Gainsborough Rail & Bus Group) have a meeting with Northern Rail's pricing and timetable team in Leeds this month. Our pro-active and excellent partnership working with Northern and the Brigg Line means that the foundations are now being laid for a better future for this 72-mile-long line. Extra Brigg Line posters are going up at Doncaster and York as we speak thanks to the partnership work with East Coast. October 2015: Problems with the Brigg line were all too apparent this month, with trains arriving up to an hour and a half late. Traction problems at Kirton In Lindsey were of particular concern, exacerbated by leaves on the line. One passenger reported that his train "had problems between Brigg and Kirton In Lindsey getting grip on the rails. As we started the descent into Kirton In Lindsey station from the tunnel it was quite clear that the brakes were on but due to the track issues we were on free-fall down the track. Despite the best efforts of the driver to stop we overshot the platform by around 500 yards, much to the shock of the waiting passenger who thought we had left her". We are delighted to say that both the Brigg Heritage Centre and North Lincolnshire Council have now updated their webpages to include details of the Brigg Line. The Northern Rail 'Meet The Manager' event will take place on Thursday 12 November, 10am - 12pm, Bandstand, Market Palace Brigg. September 2015: Friends Of The Brigg & Lincoln Lines are disappointed by the new December-May timetable for the line. Some very small tweaks - allowing trains to connect with other trains - would make the line so much more attractive. Instead nothing has changed much - in fact one service has got slower, missing a vital connection by two minutes! September 2015: Friends Of The Brigg & Lincoln Lines Rail Group (FoBLL) with its partners the Gainsborough Rail and Bus Group (GRaB) has published a railway guide to promote rail travel in Northern Lincolnshire on the Saturday-only Northern Rail service that runs between Sheffield Midland - Worksop - Retford - Gainsborough - Cleethorpes via Brigg. The guide which has been funded by Northern Rail, Lincolnshire County Council, Brigg Town FC and a number private donations will be on displays at manned railway stations on the line as well as local tourist information centres and libraries. It's hoped this guide will promote more passengers to use the present Brigg line railway service; this will be a tool in forwarding the case to the new Northern Rail franchise holder for a 6 day a week service which the line lost in October 1993. Part of the line was also threatened with closure in 1988. Both groups are still pressing for an early Saturday Only, Cleethorpes to Sheffield via Brigg rail service to cope with demand. 31 August 2015: The Friends Of The Brigg & Lincoln Lines have met with North and North East Lincolnshire councils to discuss how to encourage more people to use the Brigg line services and visit Brigg by Train. Contact the group for details. 14 August 2015: Following on from the farce of trying to squeeze a four-car 142 Northern Rail unit on the Cleethorpes platform at Brigg a few weeks ago, due to the new signaling works that had been dug under the platform instead of fixed onto the side of the platform like in most cases, a FOI request went into Network Rail. Here is their response. 13 August 2015: Barry Coward of Gainsborough Rail and Bus Group has written this article in the Gainsborough Standard, talking about Lea Road and Central Stations. 6 August 2015: It looks like Network Rail has made a U-turn over the issue of footbridges. An article in the Gainsborough Standard suggests that the current bridge at Gainsborough Central Station will remain in place until the issue of disabled access has been solved. We'll keep you posted. 16 July 2015: The Rail Minister, Claire Perry, has agreed to meet Cleethorpes MP, Martin Vickers, to discuss the Sheffield-Gainsborough-Cleethorpes line. Martin Vickers used Transport Questions in the House of Commons to draw the attention of the Rail Minister to the dilapidated states of many of the stations along the Sheffield to Gainsborough to Cleethorpes rail route. Find out more. 10 July 2015: FoB&LL met with representatives of Network Rail to discuss recent issues. The group has found communication with Network Rail very difficult - but improvements have now been promised. Issues discussed included signal box opening times and the serious concerns around footbridges and accessibility. July 2015: Interested folks enjoyed a guided walk from Barnetby to Brigg using the Brigg Line services, thanks to Stuart Parker from the Penistone Line Partnership. Northern Rail kindly allocated a Class 150 unit instead of our British Leyland cattletruck railbus that sadly trundles up and down the line - the special train was greeted with smiling faces at every station! Problems such as littering, mess and weeds were apparent at Brigg and Gainsborough Central stations - but a good day was had by all. Photos here. June 2015: Friends Of The Brigg & Lincoln Lines (along with Gainsborough Rail and Bus Group and Lincolnshire County Council) met with Network Rail this month. Discussion focused on the footbridges at Brigg and Gainsborough Central, with FoB&LL and others stressing the importance of access for wheelchair-users and parents with pushchairs. Also in June, the campaign featured in the Gainsborough Standard: "The feedback from locals was that Gainsborough had been forgotten by the powers that be". May 2015: Join us for a guided walk on Saturday 4 July. Supporting the Saturdays-only limited train service on the 'Brigg Line', we stroll around Barnetby before visiting the last remaining postmill in the north of England at Wrawby with wonderful views over the Ancholme Valley. Finish at the market town of Brigg in good time to catch the 3:50pm return train to Gainsborough and Sheffield or 5:20pm train to Grimsby and Cleethorpes. Find out more here. April 2015: Here is the new timetable for the Sheffield Midland - Gainsborough Central - Kirton In Lindsey - Brigg - Cleethorpes Line. Despite a meeting with the Northern Rail timetable and planning department you will see there is no improvement. One example is Brigg to Barnetby where the 0919 departure has 19 minutes to get to Barnetby 6 minutes away. Despite this, passenger numbers are holding up well, and with the new 'Brigg Line' information boards going up numbers should be increasing again. Another official complaint about this route's timetabling will be heading Northern Rail's way. It's election time; in these very short audio clips, the Labour, Liberal Democrat and Conservative candidates talk about transport in Gainsborough. We are delighted to announce that the green light has been given by West Lindsey District Council to our grant application for a 1960s style enamel sign for Gainsborough Central that will be placed outside the Marshall's Yard shopping complex. This follows on from the new tourist signs at Gainsborough Central that have been supplied by WLDC and the news that new tourist fingerpost signs are to be placed between Lea Road and Central by Lincolnshire County Council in the near future, both thanks to the persuasion of both rail groups. On Saturday the Gainsborough Rail and Bus group kindly helped fix the new Northern Rail timetable board that has been placed at the bottom of Station Hill in Gainsborough; this will be used to display the Brigg Line timetable and events that will be happening on the line. FoBLL have been on a number of trips to other Friends groups in the last few weeks; see photos here. Gainsborough Central Station has featured twice in the Gainsborough Standard; see both articles here. Gainsborough Central Station has new seating. March 2015: All are invited to Gainsborough's first ever Meet The Manager Rail event, on Tuesday 28 April between 10am - 12:30pm at the Marshalls Yard shopping complex. The event has been arranged by the Friends Of The Brigg & Lincoln Lines Rail Group and the Gainsborough Rail & Bus Group. This is a golden opportunity for the town to show their voice! After a 16 month wait, Network Rail contractors have finally cut down the trees on the Sheffield Platform at Gainsborough Central that had been damaging the foundations. See photos. Representatives of The Friends Of The Brigg & Lincoln Lines have met with Alex Hynes, Managing Director of Northern Rail. Issues of timetabling and stock and the state of local stations were discussed. After the meeting a suggestion was made that FoBLL talk to Viva Rail and put forward the suggestion of the refurbished ex London Underground D78 stock working on the Sheffield Midland to Cleethorpes via Brigg line on trial. We have now approached Viva Rail with this suggestion and await their response. The Brigg Line has come up in the House Of Commons Transport Select Committee, question 22. The matter of the bridge at Gainsborough Central Station has been raised in the Gainsborough Standard. The Brigg Line and Brigg Station have featured in Brigg Matters and Brigg News. David Prescott, Labour Party Candidate for Gainsborough, has made this video mentioning Gainsborough Central and the Brigg Line. February 2015: Friends Of The Brigg & Lincoln Lines have featured in this article in the Retford Times: 'Franchise firms must improve Retford train passenger services'. February 2015: "Campaigners are urging rail bosses to re-think two new bridges which they claim would leave some families and disabled people stranded" - read the full article in the Lincolnshire Echo. The group has also made this video with David Prescott, Labour PPC for Gainsborough. February 2015: The Friends Of The Brigg & Lincoln Lines have been busy lobbying for the new footbridges at Brigg and Gainsborough Central stations to have ramps. They have received messages of support from local prospective parliamentary candidates and from Brigg Town Council. We will continue to call for more accessible bridges at these stations. November 2014: We have set up an online survey for any customers that travel on the Sheffield-Lincoln or Sheffield to Cleethorpes via Brigg lines, or interchange at either Retford Low Level or Worksop stations. Please help us to understand all of the issues on these lines by filling it in - thank you! We are also pleased to announce that in partnership with the Gainsborough Rail & Bus Group we have been chosen for an award for best new group by Railfuture. This is in recognition of the hard work that both groups have put in with their partners along the line to promote the 72-mile-long, Saturday-only Sheffield Midland - Gainsborough - Kirton In Lindsey - Brigg - Cleethorpes rail service. October 2014: This month marks the 21st anniversary of the last weekday passenger service to run between Sheffield Midland and Cleethorpes via Gainsborough Central, Kirton in Lindsey and Brigg. See the photo, above right. Alex Hynes, MD at Northern Rail, showed his support at an event this month. See photo, right, of Alex with the iconic Brigg Line passenger timetable poster. Friends Of The Brigg & Lincoln Lines are calling for better facilities at Retford station, particularly at the low-level platforms serving the Sheffield to Lincoln line. Here the concrete shelters are unglazed, there are no toilets and there is only a lift on one side. These issues were recently covered in the Retford Times. Brigg MP Andrew Percy met the Rail Minister, Claire Perry, at Barnetby station. He took the opportunity to lobby the Minister on the Cleethorpes-Brigg-Sheffield line. Find out more here. September 2014: We have been told that the footbridges at both Gainsborough Central and Brigg will be repaired and repainted, starting in January 2015. August 2014: The summer issue of Brigg Matters (the quarterly newspaper that is delivered to all 2,213 households in the town) has a section about travelling on the train at Brigg Station and the Rail Action Plan that was professionally done by Gainsborough Rail and Bus Group. The article can be found on the top of page 18. August 2014: Friends Of The Brigg & Lincoln Lines - together with Gainsborough and District Rail and Bus Users Group - have responded to the Government's consultation on the new Trans Pennine and Northern Rail franchises to be let in 2016. To support their written response they have made this video. 9 May 2014: The Friends of The Brigg & Lincoln Lines, along with partner groups, have launched the Brigg Line Master Action Plan. The plan includes the short, medium and long term goals for the railway line and its surroundings, including an improved railway service in the near future. 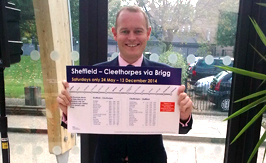 The Brigg Line currently has a 'Saturday only' train service of 3 trains each way from Sheffield to Cleethorpes. We will be presenting a case to the Department for Transport to highlight the need for a new realistic train service from the start of the new Northern Rail franchise in early 2016. As part of our case, we will present a petition in support of the Brigg Line Master Action Plan. Please sign the petition here. 19 March 2014: "A scene of desolate neglect": Gainsborough Central Station has featured in the local newspaper. 6 March 2014: Gainsborough Central has been highlighted as the worst station in Britain by BBC Radio Lincolnshire and BBC Look North. We have spent today filming at Gainsborough Central explaining how we are all working together with Northern Rail to improve the station and the services. March 2014: With the letting of a new rail franchise for the North of England by the Government in two years from now, rail user groups in the North of Lincolnshire have combined to produce an action plan for Gainsborough, Lincolnshire. Gainsborough Central Station - described as the worst in Britain by The Times, and something you would find in worn-torn Beirut in Rail magazine - has three trains each way on Saturday only from Sheffield Midland to Cleethorpes, yet it stands adjacent to an award-winning shopping centre and areas of employment. The action plan follows on from a similar plan produced by North Lincolnshire Council for Brigg, another market town on the same line. Both are intended as working documents to help partners work towards a brighter rail future for the area. A spokesperson for The Friends of the Brigg and Lincoln Lines said: "This plan is the result of collaboration with Northern Rail, Network Rail and local bodies. It is a working document which along with the Brigg plan and one we intend to produce for Kirton Lindsey will form part of our submission to the public consultation due this summer on the new rail franchise. The plan also contains short term gains that can be achieved to increase passengers on existing services." January 2014: The Friends Of The Brigg & Lincoln Lines met with representatives from Northern Rail at Brigg Station. The possibility of regular passenger trains for Brigg after 2016 was raised - find out more in this local press article. Winter 2013: Network Rail are to replace both Brigg and Gainsborough Central footbridges in 2014 after a campaign by our group saying that they were unsafe. They have also repainted Gainsborough Central signal box to make it look more pleasing to the eye. A mass meeting is planned on 10 December at Gainsborough Central with Northern Rail management to discuss the refurbishment of the station. Autumn 2013: One of our group's main tasks is to bring a better passenger service to Gainsborough Central. The station is located in the heart of this large Lincolnshire town but has a 'Saturday only' train service, and sadly the station is in disrepair. Due to the limited service there is very little signage to the station either on the main roads or in the town centre. We are asking local businesses to promote Gainsborough Central on their webpages.